Objective : This study aims to determine the prevalence of supraorbital ethmoidal cells (SOEC) among Filipinos in a single tertiary government institution. Results: A total of 474 CT scans (60 PNS and 414 Craniofacial) performed during the study period were considered, with 55 excluded for age < 13, and 296 excluded for craniofacial fractures. None had congenital craniofacial deformities. Eighty-five of 123 CT scans (69.11%) or 147 of 246 sides (59.76%) demonstrated supraorbital ethmoidal cells. There were 62 (72.94%) males and 23 (27.06%) females, ages ranging from 13 to 83 (mean age between male and female was 39.53 and 43.57). The scans showed 62 (50.41%) patients with bilateral and 23 (18.70%) with unilateral SOEC. 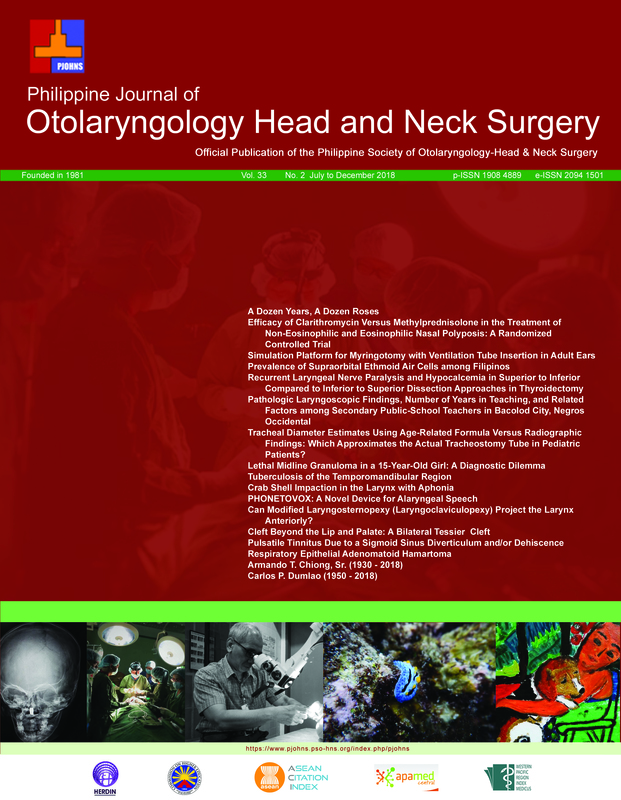 Twenty-two (25.9%) patients were identified with chronic rhinosinusitis and two of whom were considered to have maxillary sinus mass. Two out of 5 patients with SOEC presented with aplastic/hypoplastic frontal sinus. Conclusion: Our study suggests that Filipinos may have a higher prevalence rate of SOEC than their Chinese, Japanese and Korean counterparts and bilateral SOEC are more predominant than unilateral SOEC.